High-end bottles that look like they hold wine, vodka, immortality. Granddad was right on two counts: The consistent flow of straight-from-the-mountainside water, so clear you could see the minute ridges in the stones at its bottom, would have brought a private farmer a tidy extra income. And the water tasted wonderful. To me its cold perfection conjured up sensations of sweet cinnamon candy, of autumn mornings after an all-night rain, of silver bells and big drifts of fresh snow. Granddad and I agreed that Black Valley Spring must have the best-tasting water in the world. From such humble childhood origins I have arisen to become an internationally-recognized water taster. Bottlers in exotic locales from Bosnia to Tasmania, from Saskatchewan to Daytona Beach, all look to me for corroboration that they produce the most delicious water on the planet. My carefully considered judgments, culminating in gold, silver, and bronze medals, can elevate an obscure spring source to prominence in the crowded, competitive, multi-billion-dollar bottled water business. Sounds far-fetched? Well, yes and no. You be the judge. 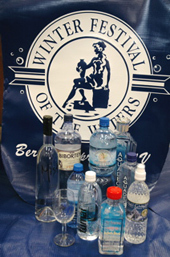 Every year the town of Berkeley Springs, West Virginia hosts an international water tasting competition. Berkeley Springs, population 670, is an ideal location for such an event — the hamlet is known for its tiny state park that features mineral-rich springs, bubbling from the ground at a constant temperature of 74.3 degrees. For more than 200 years Berkeley Springs has been a spa destination, at times posh and popular (George Washington bought property there in 1777), at other times largely ignored. During its peak years in the 1890s it rivaled Saratoga as a resort for the well-to-do. In today’s era of body peels, self-pampering massages, and short-drive getaways, Berkeley Springs has resurfaced as a fine place to spend a weekend. Mid-Atlantic tourist destinations face one dilemma: the off-season. From about Thanksgiving to Easter, roughly the period when the trees are bare, places like Berkeley Springs grow silent. Silent is not good for the local economy. Hence, the water tasting competition. The brainchild of city boosters, it has been held annually in February for the last 18 years. While failing to attract throngs of eager out-of-towners, the competition has been a roaring success for Berkeley Springs. Jay Leno and Keith Olbermann have poked fun at it on their shows, increasing brand recognition for the town. More important, this water tasting competition — the largest of its kind held anywhere — affords bragging rights to its winners, and that can translate into increased sales. Many gold and silver medal-winning waters incorporate the competition logo onto their packaging, as if they have received some sort of Olympic-caliber cachet. Few consumers stop to think how perfectly preposterous this is, how anything as ubiquitous as water can have an annual gold medalist for the entire world. Winter is my favorite season in Berkeley Springs. At night in the park, the warm water meeting the frosty air sends wisps of mist swirling in eldritch patterns that evoke Middle Earth or Edvard Grieg’s “Hall of the Mountain King.” During the day, the various spring heads reveal their hidden workings, unclouded by the throngs of summertime waders. The water roils the spring’s silicate layer. Bubbles rise and burst in unpredictable patterns. Large crayfish scuttle past. In any other waterway in the region, they would be sleeping under skims of ice, waiting for the thaw. Roughly 1,000 gallons of water surge every minute from the series of spring sources in the park. The water rolls through a small network of spillways and into a tunnel that unites the spring with a neighboring conventional stream. The water in Berkeley Springs is in a hurry. It is flamboyant in its abundance. Watching it rise from the ground and course through its channels, it’s possible to forget for a moment that our planet’s fresh water supplies are running lower by the day, that over 40 million people don’t have access to adequate sanitary supplies of water, that states in America and countries in the Middle East are already squabbling over water rights — a first round skirmish in what is sure to be a prolonged, worldwide battle. Forget the wars over crude oil. In this new century, the commodity worth fighting for will be water. It would take some doing, but we could live without oil. Water is another matter. Even as the bucolic spillways discharge their bounty in Berkeley Springs, experts have sounded the alarm. We are running dry. 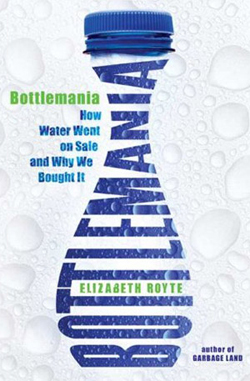 This is not good news for the bottled water industry, a huge business that only began to lure the American consumer in the 1970s. Bottled water has always been a staple in Europe, land of ancient and questionable plumbing. In America, bottled water’s popularity began with a single major player: Perrier. Drinking the French bubbly became fashionable in restaurants, and then in gourmet food stores. It finally gushed into supermarkets, where American consumers bought enough of it to gain the attention of Big Business. The San Francisco Chronicle reported that in 2006 Americans spent $11 billion on bottled water, drinking some 8.3 billion gallons. That’s 28 gallons for every American — about half the average intake of soft drinks, but still more than milk, coffee, or beer. Entrepreneurs have scrambled to get a piece of this action, from multinationals like Coke, Pepsi, and Nestle to little family-owned spring water companies that market locally. Why this sudden passion for bottled water, a product that practically didn’t exist in America just 40-odd years ago? While environmentalists decry the entire process of creating plastic bottles, filling them, capping them with more plastic, and shipping them all over the place, consumers keep on buying. Most people would say they buy bottled water because it is healthier and safer to drink than the stuff that pours from the tap. But a significant minority of users would offer another answer: Bottled water tastes good. Tap water doesn’t. The Berkeley Springs water tasting competition endorses this view. Municipal tap water is judged in one flight, bottled spring water in another. I’ll be candid: The very best municipal water just cannot compete with spring water, or even purified tap water like Aquafina, when taste is the only criterion. People who say they can’t taste the difference between bottled water and tap water are lucky indeed. There is a difference, and usually it’s not even subtle. The question becomes this: In a century when water supplies are running thin, does anything really justify a wasteful practice like shoving a dollar and a quarter into a vending machine for a bottle of Aquafina? This philosophical debate forms the centerpiece of the series of Friday afternoon lectures that precede the Berkeley Springs water tasting event. Over the past two years the bottled water industry has been a target of environmentalists, much the same way disposable baby diapers came under attack 20 years ago. With an eye to future profit margins and improved public relations, the makers of bottled water are taking steps to reduce the carbon footprint of their products. 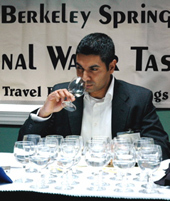 In Berkeley Springs, bottled water’s defenders include the competition’s perennial Water Master, Arthur von Wiesenberger, and Nayl D’Souza, editor of Water Innovation Magazine. I suppose my own academic background had predisposed me to expect that a “Water Master” must have a lengthy and distinguished scholarly background, perhaps a Curriculum Vita as thick as a rural phone book. Instead, von Wiesenberger displays the easy elegance of a to-the-manor-born, self-taught bon vivant. Raised abroad, he spent his youth drinking bottled water of necessity. Partly from nostalgia, partly from preference, he returned to California as an adult with a stash of local European bottled waters. A friend asked him to write a magazine story about the relative flavors of water, and von Wiesenberger discovered that no American had written at length about this fascinating subject. He compiled research, got a book contract, and on the strength of the book (1978’s Oasis: The Complete Guide to Bottled Water throughout the World) found plenty of consulting work for firms like Anheuser Busch. More recently von Wiesenberger has been in another line of endeavor. As co-publisher of the Santa Barbara News-Press, he has presided over a daily newspaper embroiled in litigation brought against it by former employees who have questioned the official reasons for their terminations. Perhaps this weekend respite from a troublesome day job accounts for the Water Master’s affability. I try to imagine sneaking into a dark alley, to an unpainted doorway where I whisper a password to be allowed to go inside for a bottle of Perrier. I suppose this could happen, but only out of biological necessity; namely, a population-threatening decline in water supply. Nayl D’Souza, an earnest young man who resides in Bath, England, lays out a more detailed defense of the industry. According to D’Souza, every major beverage company has created serious initiatives to reduce the carbon footprint of bottled water. Fiji, a company that has been particularly excoriated for its environmental impact, has begun funneling some profits into forest preservation on its home island and now ships some of its product by boat into Philadelphia rather than trucking it across America from ports on the West Coast. Icelandic, another popular brand, has been donating water to African villages that lack sanitation facilities. It is heartening to hear that the multinationals are paying close attention to this issue. But in his defense of bottled water, D’Souza overreaches. It’s true, as he suggests, that bottled water is “hygienic.” When he praises 12-ounce plastic bottles as “portable,” however, I instantly recall the aluminum canteen I used for years as a Girl Scout and the sturdier re-usable plastic bottles available in the sporting goods aisles at any department store. Portable all, more environmentally sound, and in the long run much easier on the wallet. Then Water Innovations magazine’s editor shows a graphic comparing bottled water’s carbon footprint to that of another American favorite, the hamburger patty. According to his statistics, a pound of ground beef requires 5,000 liters of water for production and up to 20 megajules of energy. One liter of bottled water requires three liters of water for production and only 7 megajules of energy. Never mind how bad that hamburger is for the environment. We all know that. What sticks in my mind is that every time I buy a 12-ounce bottle of water, 24 more ounces went into its production. That may not be as wasteful as sprinkling a residential lawn or irrigating corn that will be used as livestock feed, but it’s still wasteful. It’s a waste I can correct simply by switching to tap. If I make a resolve never to touch bottled water again, it quickly departs after listening to the afternoon’s next presentation. Scott Shipe has the unenviable job of lobbying Congress to do something about our nation’s antiquated water infrastructure — networks of ancient cast iron mains and pipes, mostly presided over by local municipalities full of disgruntled taxpayers. Shipe holds up a section of iron water main that had been dug up in Frederick, Maryland, where he lives. The inside looks like diseased tissue. The word Shipe uses, “tubercular,” sums it up beautifully. Shipe gives the American Association of Civil Engineers’ estimate for a federal update of all existing water infrastructures: one trillion dollars. Until that money can be found somewhere, water pipes will seep and leak underground, wasting a precious resource. To date, Shipe ruefully admits, he’s had little success convincing Congress to address the issue. The final speaker, Joe Hankins of the Conservation Fund, sounds the most sober note of the afternoon. Water quantity is reaching crisis levels, not only for poor kids in Africa, but also for wealthy kids in Atlanta. A drought in Georgia during the fall of 2007 became so severe that Atlanta mayor Shirley Franklin told the city’s 5 million residents that they had only a 90-day reserve supply. What happens when 5 million people run out of water? Will Georgia try to change its state boundaries in order to capture more water from Tennessee? How will residents of Tennessee feel about having their water piped to Atlanta? Just as we over-consume everything else, we Americans are over-consuming our landscape. Hankins uses a local example: Washington County, Maryland. Old aerial maps of Washington County show countryside dotted with springs and streams. Most of these are gone now, buried under shopping center parking lots and residential developments. In their place, layers of asphalt allow storm water to race away into culverts rather than to seep into the ground. In Washington County, this has caused a significant drop in the water table. And still the county’s population grows, day by day. Hankins and his nonprofit are advocating a “green infrastructure” that includes rooftop gardens, high-density housing, and the purchase of targeted properties to keep them natural. “We need to create landscapes that capture and retain water, especially storm water,” he says. In my mind I see Granddad’s rain barrel, brimming after a thunderstorm. We could wash dishes for a week with the water from that barrel. And then, generally, it would rain again. Or rather, a matter of survival. No water, no Coke. On the morning of the competition, I turn on the shower and brush my teeth while the shower warms up. When the shower’s temperature suits my taste perfectly, I step inside and perform my habitual routine — a lengthy and luxurious bask with separate (plastic-bottled) shampoo and body wash. It is only as I begin to towel off that I remember the bathing routine at Granddad’s house. Basin of water, wash cloth, bar of Ivory. Moisten body with wash cloth, hand-lather on the Ivory, rinse with the wash cloth. Throw the remaining water onto the garden. How snobbish I’ve been to excoriate water bottlers for using more water than they sell! In one shower I’ve probably consumed five to 10 times as much water as I needed to use. Point of fact, Granddad would have told me I didn’t need a shower at all. I had one yesterday. We water judges assemble in the comfortable banquet hall at the Country Inn, a private spa on the edge of the Berkeley Springs state park. We are 10 in number, six women and four men. As for experience in what we are about to do, we have next to none. One of the fellows, a local TV journalist, has done this before. Another just sold his siphon business in Pittsburgh. For all practical purposes, however, we could have been plucked off the street. Von Wiesenberger spends about 30 minutes educating us in the nuances of water tasting and answering our questions. His instructions are casual and have an air of rehearsed spiel. He tells of a baker in Los Angeles who liked some dinner rolls at a Seattle restaurant and got the recipe to use back home. Somehow, the same recipe didn’t work in L.A. The baker tweaked it and tweaked it. Then he got the idea to get a jug of Seattle tap water and make one last batch. A-ha: The rolls were perfect when prepared with that water! So far as von Wiesenberger knows, the only scientific study of the taste of water occurred at the University of California, Berkeley, where a professor subjected his students to a series of water tests in which the mineral content grew or changed with each subsequent taste. The professor sought to discover how tolerant the average person might be of water that had a strong flavor. His study revealed which minerals tasters found acceptable and which turned them off, and he shared the data with municipal governments and bottlers that were seeking tastier water. Von Wiesenberger quickly explains the factors that cause differences in the taste of water. Chlorination and other sanitation techniques, of course, influence the flavor of municipal waters, but municipal waters may also contain minerals that escape a city’s filtration process. The taste of bottled-at-the-source spring water also varies with mineral content and with the geologic layers through which the water flows. 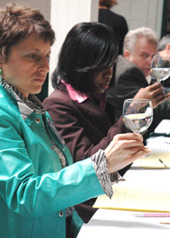 The most difficult flight of water to judge according to taste is the “purified” water – your Aquafinas – because the bottlers of those waters deliberately seek to remove all vestiges of flavor. These are truly the tasteless waters, but he assures us that if we attend closely we can find subtle differences. We each receive a copy of von Wiesenberger’s pamphlet, a water-rating sheet, and a checklist of 14 statements we can use to judge the quality of each entry. The checklist begins with a low of “1: TERRIBLE, STRONG TASTE” and proceeds through a juggling of adjectives to “14: REAL GOOD.” Acceptability is also measured at each level from “1: ‘I can’t stand it in my mouth,’” to “14: ‘I would be very happy to have it for my everyday drinking water.’” When one of the judges points out that the list is skewed toward the negative – at Level Seven the water still has a “FAIRLY BAD TASTE” but could “possibly be acceptable,” von Wiesenberger admits the checklist could use some revision, possibly, some day, perhaps. The score sheet is daunting. We must judge the appearance of the water on a scale of one to five. We must also judge odor, same scale, and flavor, scale of one to 10. Helpful adjectives like “chlorine, plastic, sulphur, chemical, musty, salty, metallic” accompany these scoring rubrics. Then we move to a score for “mouthfeel.” Is the water refreshing? Heavy? Stale? This category gets a one to five scale. Wine connoisseurs never swallow. Water tasters are asked to do so, because part of the quality of water is its aftertaste. Is the water thirst-quenching, or does it leave a bitter residue behind? Scale of one to five. We are given a trial run of three glasses. A word about the glasses themselves: They are sterilized, hand-polished wine glasses, each one absolutely alike. The water is decanted into each from a carafe. I figure the trial run will acquaint us with the alpha and omega of waters, from best to worst or the other way around. I’m right. The first glass has clear appearance, no odor, no flavor, an okay mouthfeel, and no aftertaste. The second carries a distinct odor of chlorine and tastes the same, leaving some of the chlorinated bitterness behind on the tongue. The third glass smells and tastes like it had been dredged from the Dead Sea. I wouldn’t pour it on a house plant. Now for the results: Five judges (including myself) like the first water best. Two prefer the second water, and three like the third water best. The first water turns out to be purified spring water. The second is Washington, DC municipal water. The third had been pulled from a source on Mount Ararat. This concludes our preparation to be international water-tasting judges. The smiling water-bearers begin placing glasses in rows before us, on a white paper tablecloth with numbered circles drawn onto it. Official score sheets are handed out, and we face our first test: 23 samples of municipal water from the U.S., Canada, and New Zealand. I feel distinctly unprepared for this challenge. Behind me I hear D’Souza murmur, “This is certainly not very scientific.” He too has been given the honor of judging; he too seems anxious about his training for this test. The municipal category turns out to be a snap. Each of the 23 entries has a unique odor and taste. Some carry too much chlorine, some exude mustiness. The final glass smells and tastes very familiar, if not terribly appetizing. Afterwards my suspicions are confirmed: It is indeed Berkeley Springs municipal water, the spring source sent through an EPA-approved plant before being piped through the town. I’d had a glass of this the previous afternoon while attending the seminar. My taste buds remembered it. 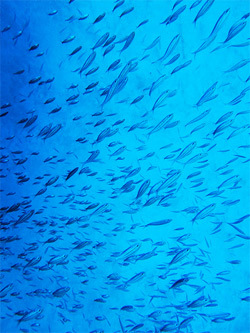 Perhaps I have a future in this crowded field. The second flight is the trickiest: “purified” water. Most purified water is just tap water from some source that has been filtered to remove every last vestige of chemical and mineral. Both Aquafina (Pepsi-owned) and Dasani (Coke-owned) are created this way, using the same water that goes into the soft drinks. Dasani has begun to add minerals back into its water to improve the taste, rather in the manner that Wonder Bread strips all the nutrients from its flour and then “fortifies” it with vitamins. 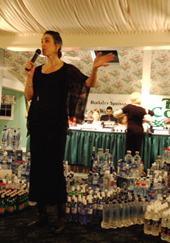 The big bottling companies do not participate in the Berkeley Springs competition. 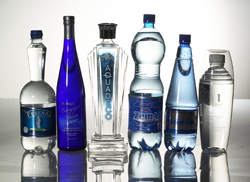 Our purified water entries come from smaller bottlers located in the U.S., Canada, the Philippines, and Fiji. A perennial entrant in this field is Daytona Beach, Florida. Having won multiple gold medals for its municipal water, the city began bottling it for sale to tourists and locals alike. Whether or not Daytona Beach wins tonight, its kicky little bottle does make a great souvenir — and conversation-starter. What, the NASCAR place has great water? Who’d ‘a’ thought? Predictably, each and every purified water smells and tastes the same. Only one has a slight woodsy aroma that sparks in my brain as reminiscent of the Black Valley Spring. I give that one the highest score. As we judge this flight, the room begins to fill with spectators. Soon all the seats in the front row are filled. The audience has come not to watch the riveting tableau of 10 people examining, sniffing, and sipping water, but in anticipation of the infamous “water rush” at night’s end. Each bottler in the competition sends a few dozen samples, sometimes in high-end glass bottles that look like they hold wine, vodka, immortality. 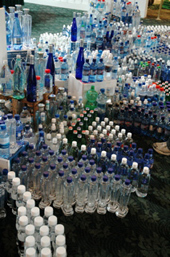 A crew of Berkeley Springs volunteers spends up to nine hours arranging all the beautiful bottles in geometric displays. It’s a breathtaking show of fabulous packaging, sitting in tiers like so many brilliant ice crystals washed with primary colors. The audience will wait patiently for that moment when the competition results have been announced and, at a signal, rush in and grab the bottles on display. The early bird viewers in the front row are bottle collectors. They eyeball the gleaming prizes, looking for the odd Bosnian entries, the cute Daytonas, the vodka wannabes. The judges get a break after completing the purified water flight. We have tasted 23 municipals and 14 purifieds. Let the bloat begin. By the time I return for the evening portion of the judging, the banquet hall has filled. The crowd of spectators is surprisingly large, perhaps as many as 200 people. We judges were told to dress in formal attire. Sadly, my prom gown fits a bit snug these days, so I stick with dressy day wear. Most of my fellow sippers have done the same, but the event’s producer, Jill Klein Rone, and Water Master von Wiesenberger, are done to the nines. They need to be. As the MCs, they are the only entertainment as we judge two more flights: 24 spring waters and 13 sparkling waters. Klein Rone and von Wiesenberger mug for the crowd, explain what’s happening on the dais where I’m sitting, introduce each of us judges. Cleansing my palate with one of the salt-free table crackers provided to break the monotony of water, I dig into the spring selections. Every one tastes the same. Is it me? Have I lost it? By glass 16 I’m sweating. What do I do now? I persevere. When I’ve finished, I ask von Wiesenberger what could have happened. He inquires if I had an alcoholic beverage during the break. Well, yes, a nice glass of white. “That probably accounts for it,” he says. The afternoon instructions had not included strictures against alcohol. Perfume and spicy foods, yes. Booze — that wonderful dehydrator — no. Oh well, only the fizzy waters remain. I happen to love carbonated water. I’m eager indeed to taste sparkling waters from Italy, Germany, Romania, Bosnia, New Zealand, and … Pittsburgh. The siphon company owner has brought some of his home grown. Bosnia has won, placed, and shown in this category for years. Apparently its mountains ooze the tastiest bubbly in the world. Several Bosnian bottlers have won gold medals and retired from the competition. Others try to fill their shoes. And succeed. 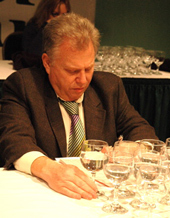 This year, Bosnian entries win second and fourth, and the gold goes to Salvus Mineralwasser of Emsdetten, Germany. I’m positively smitten with these biting, bracing fizzies. Some of them, when poured, bubble aggressively in the glass — and then taste strangely flat. Others show no sign of a bead at all, but they explode on the tongue like fireworks, like a gospel chorus that goes from still to room-rocking in two beats. I make a note of the five best fizzies. They are all superb. Even though I’ve guzzled about 80 ounces of water in the course of six hours, I go back at contest’s end and drain the glasses of all the ones I like best. While I do this, the crowd in front of the judging dais grows restless. The score sheets have been tallied, the winners have been chosen in every category. Having exhausted every last joke, Klein Rone and von Wiesenberger step aside. In fact they practically leap out of the way. The water rush commences. Some 200 souls descend on the bottle display and, with an eerie quiet intensity, strip away nine hours’ work in less than five minutes. There’s something unseemly about this great grab for high-end water bottles at a time when hurricane victims and African refugees have to fight and claw for whatever jugs of whatever quality fall into their hands. I feel as if I’m sitting in Versailles palace with Marie Antoinette. In the end, I convince myself I’m being melodramatic. For all their slick packaging and pleasing taste, the waters we’ve judged in each and every category are local legends, most not available at all outside their geographic regions. The Bosnian fizzies, no less than the champagnes of water, cannot be bought in America. Nor is anyone likely to go to Los Angeles just to get its gold medal-winning municipal water. This event does not leave a large carbon footprint. It’s all about local bragging rights. If it helps the Bosnian economy or gives the folks in metropolitan L.A. more confidence in their tap water, that can only be a good thing. How about our judging? Is it a frivolous waste of a long day? Curiously, no. Sometimes as many as 50 spring water companies enter the competition, and many of the same waters place in the top five year after year. Three of the four top municipal waters in the 2008 competition had placed in the top five before, even though all the judges were different. Certain good water does rise to the top. The sample is simply too small to make any grandiose claims to international supremacy. On my way out of Berkeley Springs the next morning, I stop by the public spigot in the park to fill the empty jugs I brought from home. I have recycled these jugs carefully, because they have screw-on tops and can be reused. I fill 12 one-gallon jugs and lug them to the car, serene in the knowledge that for the next few weeks my digestion will hum along smoothly. As I fill my last jug I strike up a conversation with a couple who are waiting with a vast array of containers of all shapes and sizes. “Isn’t this wonderful water?” I say.